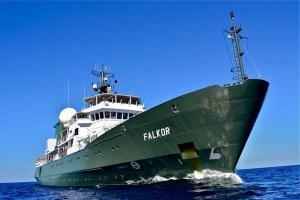 Rutstein has been selected to travel aboard research vessel Falkor for her second “Artist-at-Sea” residency in late June 2016. With the goal of making people rethink the way marine science is shared and breaking down the complexities of ocean research, Schmidt Ocean Institute (SOI) recently launched their Artist-at-Sea program, and Rutstein is the third to participate. Rutstein will sail from Nha Trang, Vietnam, in the South China Sea, to Guam, part of the Mariana Islands, located in the Northwestern Pacific Ocean. The Mariana Archipelago borders the deepest feature of the ocean, the Mariana Trench. Rutstein will create paintings in the wet lab of the ship during her time at sea, incorporating mapping data and other research collected from the region.